Encourage your child's S.T.E.M. 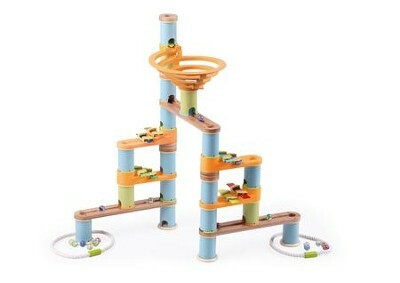 learning with the Bamboo Builder 127-Piece Marble Run Set from Fat Brain Toys. Designed for ages 4 years and older, this set features hand-crafted, carbonized tracks, colorful bamboo cylinders, and sustainable wood powder spirals that deliver multi-functional fun with an infinite number of possible designs, plus it chimes and makes music as the marbles roll this way and that. Includes 1 spiral plus 4 tracks featuring built-in chimes for making music with your marbles, plus 30 marbles and an instruction booklet. I'm the author/artist and I want to review Bamboo Builder Marble Run, 127 Pieces.